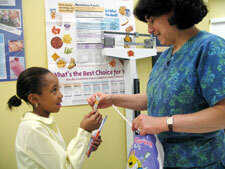 Kenyaree Jones (left), a 10-year-old fourth-grader at Orchard Gardens K-8 School, receives dental hygiene supplies from Kathy Lituri of Boston University through Smart Smiles in Boston Public Schools. Kenyaree Jones wasn’t happy about her first dental appointment. At 10 years old, she had already heard the horror stories. Or, as Kenyaree later discovered, they can find cavities. She had four of them, each requiring a filling. And by getting the fillings she prevented more serious problems, such as infection or extraction. Although tooth decay can occur at any age, adults have to be vigilant about another problem that starts in the 30’s — gum disease. The mouth is teeming with bacteria — more than 400 different types— and gum disease is caused by 10 to 15 of them, according to Dr. Nadeem Karimbux, an assistant dean of dental education at Harvard School of Dental Medicine. 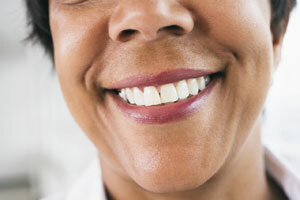 A bad taste in the mouth is usually the first sign of gum disease. Bad breath is another. But the most common red flag is bleeding when brushing the teeth or flossing. Your mouth is the window to your body’s health. The state of your oral health is an indicator of your overall health, which is why daily brushing and flossing are so important. Poor oral hygiene can cause tooth decay and inflammation of the gums. If left untreated, the inflammation can lead to tooth loss, which impacts a person’s nutrition, self-esteem and appearance.